Saint John Cantius Church in Chicago offers frequent choral Masses sung in the context of the Latin liturgy. These range from large-scale Mass settings with orchestral accompaniment by composers such as Mozart and Schubert, to setting by Renaissance composers from Byrd to Victoria. Gregorian chant is sung by a schola cantorum every Sunday. 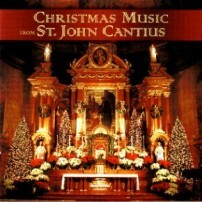 The selections on this CD were recorded at Saint John Cantius Church in Chicago, July 27-29, 2004, by the Saint Cecilia Choir. This superb ensemble sings the varied and beautiful repertoire a cappella, in the resonant acoustics of Saint John Cantius Church. Formerly known as the Society of Saint John Cantius, the community of the Canons Regular of Saint John Cantius was founded in 1998 by Fr. C. Frank Phillips, C.R. as a Roman Catholic religious community of men dedicated to a restoration of the sacred in the context of parish ministry. Its mission is to help Catholics rediscover a profound sense of the sacred through solemn liturgies, devotions, sacred art, sacred music, as well as instruction in Church heritage, catechetics, and Catholic culture. This mission is reflected in the community's motto: Instaurare sacra (Restoration of the Sacred). The purpose of the Canons Regular of Saint John Cantius is the formation of a Roman Catholic men's diocesan institute, which shall form and train men to be priests and brothers. On December 23, 1999, the memorial of Saint John of Kenty (Cantius), Francis Cardinal George, O.M.I., Archbishop of Chicago, issued a "Decree approving the statutes and erecting the Society of Saint John Cantius as a public diocesan association of the Christian faithful with juridic personality." On January 31, 2003, he gave his approval to the recently completed Spiritual Directory and Book of Customs as the local provisionary rule for the Society of Saint John Cantius — the next step toward approval of constitutions for the Society as a diocesan institute. Now known as the Canons Regular of Saint John Cantius, the community's priests have full faculties to celebrate the Holy Sacrifice of the Mass and sacraments according to the normative liturgical books of the Roman Rite (in Latin and in the vernacular), as well as all of the 1962 liturgical books. Members of the Canons Regular of Saint John Cantius live in common according to the Rule of Saint Augustine and their local Rule of Life. Members dedicate themselves to the recovery of the sacred in living the common life, striving for personal sanctity and by seeking the salvation and sanctification of all. In order to achieve these ends, special emphasis will be placed upon the study and implementation of the sacred rites of the Latin Church in their various approved manifestations. The laity can also affiliate themselves with the Canons Regular of Saint John Cantius as Associate Members. These may be men who are considering a religious vocation to the Society or individuals, male or female, married or single, who wish to help the advancement of the Canons Regular of Saint John Cantius in their capacity as a member of the laity.